As a history professor with a B.S. degree in mechanical engineering teaching at a technical college after 20 years’ service in the US Air Force, I’m sympathetic to education that connects to the world of doing, of making, of providing goods and services to consumers. Yet we must not allow education itself to become a consumable. When education becomes a commodity and students become consumers, the result is zombie education. 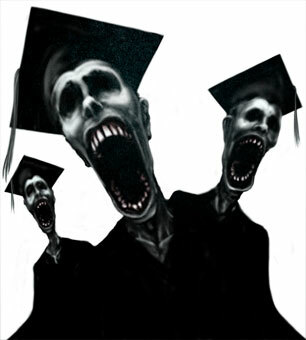 Often characterized in practice by the mindless munching of digestible bits of disconnected PowerPoint factoids, zombie education leads to more mindless consumption of commodities after graduation, a result consistent with greed-driven capitalism, but not with ideal-driven democracy. Mindless consumption is bad enough. But zombies are also mindless in political contexts, which is why totalitarian systems work so hard to create them as a preliminary to taking power. Think here of Hannah Arendt’s critique of Adolf Eichmann as a man devoured by the demands of his job (the extermination of the Jews in Europe), a cliché-ridden careerist who was unable to think outside the constraints of Nazi party ideology. But let’s return to the economic bottom line. In his signature role as Gordon Gekko, Michael Douglas in Wall Street: Money Never Sleeps (2010) describes the latest generation of college graduates as NINJAs (no income, no jobs, no assets). Basically, they’re screwed, he says. This may even be true if you view a college diploma strictly as a passport to a vocation that pays well. But true education is much more than that. True education is transformative. It’s soul-enriching and soul-engaging. It opens alternative paths to living that don’t begin and end at the workplace. It measures personal fulfillment in ways that aren’t restricted to take-home pay. Higher education is (or should be) about enriching your life in terms that are not exclusively financial. It’s about the betterment of character and the development of taste. It’s about becoming a savvier citizen whose appreciation of, and dedication to, democracy is keener and more heartfelt. And that’s precisely why it’s worthy of greater public funding. State and federal funding of higher education must be restored to previous levels precisely because an informed and empowered citizenry is the best guarantor of individual freedoms as well as communal well-being. Education, in short, is not a commodity – it’s the commonwealth. But today’s view of education is often narrowly focused on individual profit or vocational training or STEM (science, technology, engineering, mathematics), a bias that carries with it class-based strictures. Students are told it’s OK to be selfish but also that their role is to be consumers, not creators; conformists, not dreamers. Powerful institutions at local, state, and federal levels share this bias. Educators currying favors from business and industry spout bromides about “competitiveness.” Business leaders address graduates and tell them the secrets to success in life are a positive attitude, punctuality and smart clothes. If we view education as an ephemeral commodity in a world of goods, so too will our students. They’ll lump it together with all the other trivial, product-based, corporate-funded information with which they’re constantly bombarded. Critical thinking? Informed citizenship? Boring. And could you shut up a minute? I need to take this call/send this tweet/update my Facebook. Staring vacantly into electronic gizmos as they shuffle to and from class, students are already halfway to joining the zombie ranks. Let’s not infect them further with commodity-based zombie education. Of course, back then such an education was reserved for young men. We congratulate ourselves today for including the “her” with the “his,” of promoting “diversity,” usually defined in racial or gender or ethnic terms. But what about the diversity of a college education that embraces, not just hardheaded utility or the politics of identity, but ideals about the beauty and nobility of life? What about the fostering of judgment, the ability to go beyond prefabricated, binary thought processes of ideology to a form of thinking that can assess the value and significance of events, situations, and choices on their own terms? But zombies don’t care about beauty or nobility. They’re not worried about making judgments, especially moral ones. All they want is to consume. Defined by their appetite, they are hollow people, easily led – and easily misled. As long as we market education as a consumable, the zombies will come. They may even find ways to pay their tuition. Just don’t expect them to de-zombify upon graduation. Just don’t expect them to become noble citizens inspired by, and willing to stand up for, the beauty of true democracy.